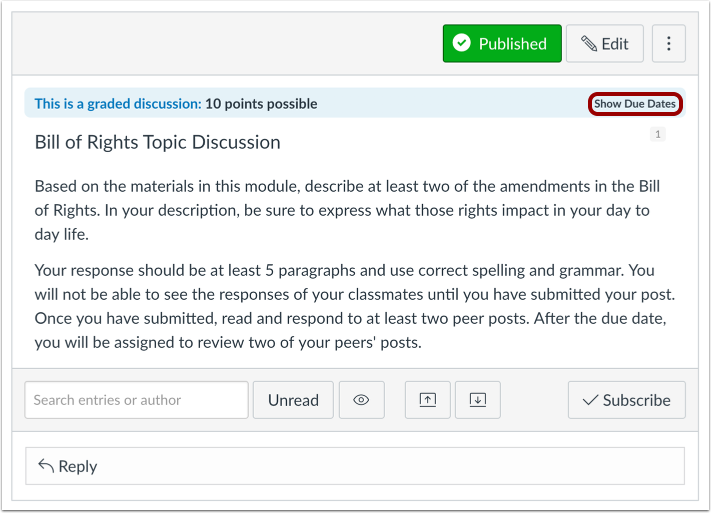 When creating or editing a graded discussion, you can assign a graded discussion to a specific course section. Availability date functionality is still available for each graded discussion. Only the section(s) specified in the discussion details can view the graded discussion. 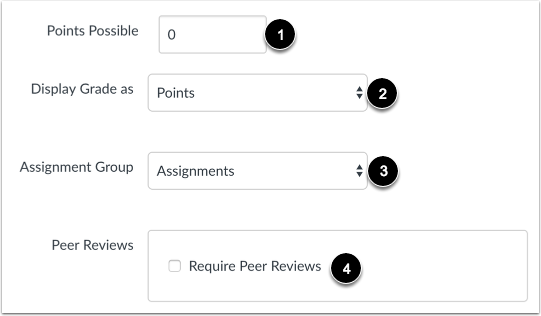 When using differentiated assignments with the Gradebook, the graded discussion appears as a column for all students, but grade cells are grayed out for students who have not been included in the discussion. Grades cannot be assigned for students who have not been included in the graded discussion, and graded discussions that are not assigned to a student are not factored into overall grades. Enter a title  and add content  to your discussion. 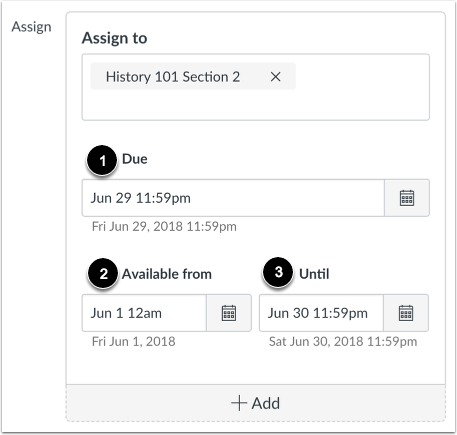 By default, Canvas will set your assignment for everyone in your course. 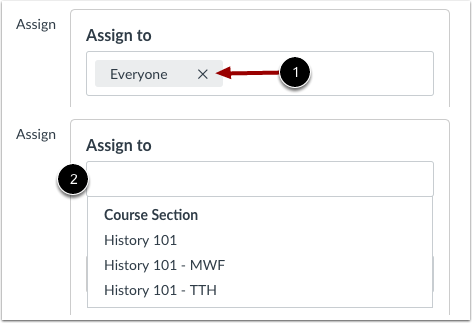 To create the assignment for a specific section, click the Everyone remove icon , then start to type in the name of a section . When the section name appears, click the name. Lists are not scrollable. You can include more than one section in the To field as long as the section is to be assigned the same due and availability dates. To add another section with a different due date and availability dates, click the Add button. 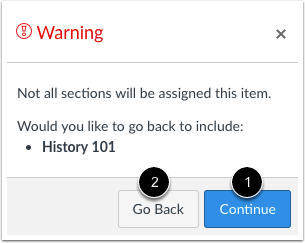 If you do not add course sections to the assignment, you will see a warning message asking you if you want to add those sections. 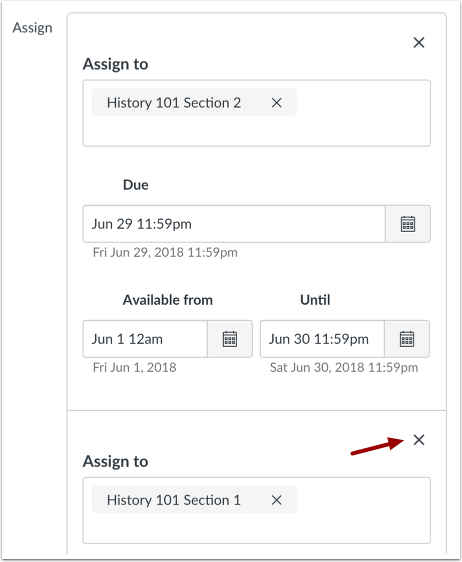 You can click the Continue button  if you don't want to add any sections to the assignment, or click the Go Back button  to go back and add additional sections. 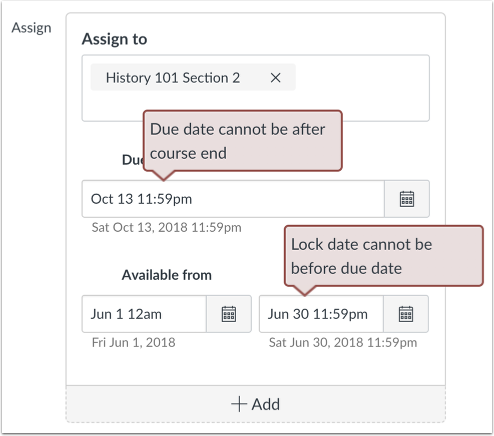 If the course does not include specified course start and end dates, Canvas validates the graded discussion against the term date set for the course. 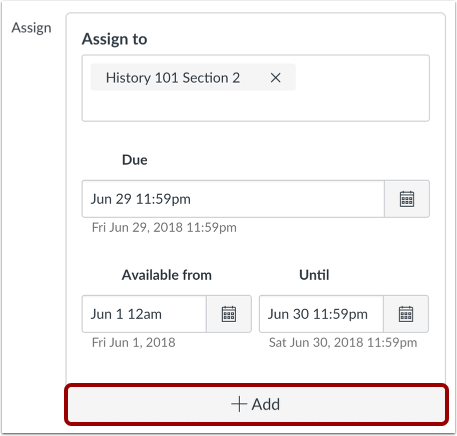 If your course is using Multiple Grading Periods, the Assign field validates the due date against the closed grading period and requires the discussion due date to be past the date of the closed grading period. To view users and due dates for the discussion, click the Show Due Dates link. View the dates assigned to the graded discussion. 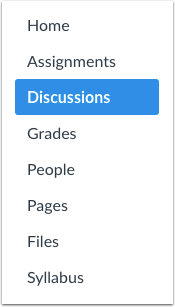 On the Assignments Page, the graded discussion shows there are multiple users and dates assigned to the discussion. Hover over the text to view date availability. Previous Topic:How do I assign a graded discussion to a course group? Next Topic:How do I reply to a discussion as an instructor? Table of Contents > Discussions > How do I assign a graded discussion to a course section?